For the longest time after the curse fell, I did not know if I was a beast who dreamed of being a man, or a man who dreamed he was a beast. So begins Leife Shallcross's enchanting retelling of Beauty and the Beast, which has always been one of my favorite fairy tales. Over the years, I've read many different versions of it. Robin McKinley's Beauty has long been my favorite, but this latest retelling is now a close second. 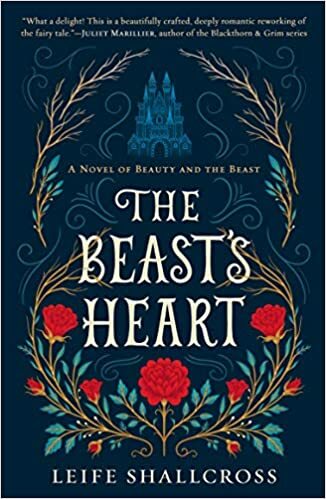 Overall, The Beast's Heart sticks closely to the traditional story line. Where it differs is that it's told wholly from the Beast's point of view, and that's what I liked about it. Seeing him struggle to understand his curse, and despair of ever breaking it, made the story that much more poignant and endearing. And then he meets Isabeau, his 'Beauty', and the Beast begins to not only fall in love, but to hope. I turned to stare at Isabeau. It was her. She was the key. Since she had arrived, the magic that held this place had started to weaken. First the birds and animals had begun to come back to the forest; now the seasons were returning to my garden. If this curse could be broken, she could do it. I didn't know how. ... But she was the key to the ending of this spell. If you like fairy tale retellings, this is a good one. I liked Isabeau's two sisters, Marie and Claude. And I liked Isabeau. But most of all, I liked the Beast. I'm not sure I have a favorite fairy tale, I'll have to think about that! But this does seem a popular one. Earlier this year I read Aliette de Bodard's In the Vanishers' Palace, a queer retelling set in a Vietnamese-influenced world, with dragons! I love fairy tale retellings and Robin McKinley so I'm definitely adding Leif Shallcross' book to my list! There's a lot to like about this book! I love fairytale retellings; I love Beauty and the Beast; and I love Robin McKinley's Beauty. If you say this one is a close second to that one, I'm definitely going to read it. I've just placed a hold on it at the library. I am glad you enjoyed this one, Lark. I have been wanting to read this one. I love the story of Beauty and the Beast, even if it isn't the popular opinion these days. I still need to read Robin McKinley's version too . . . I'm glad you loved this one. I had kind of low expectations going in but I ended up loving it too and it was great it was told from Beast's POV. My book club and I ended up reading this and peppering Leife over Whatsapp with all sorts of questions -- one of the best times to be Australian reading an Australian author lol It was such a gem to read! Oooh, I hadn't heard of this before, but it sounds really good. I'll have to check it out. I like the idea of the story being told entirely from the beast's point of view. That's what I really liked about it. I loved McKinley's Beauty as well, and I'm a sucker for fairy tale retellings. I can not tell I am a retelling expert, but everything I have read so far I liked. I would keep this book in mind.